extended: It's Christmas Party Time, Ladies! It's Christmas Party Time, Ladies! When etheric Major Amasova arrives to a party in her layered signature style like no-one else's - wearing peep-toe ankle boots, simple-line winter coat and Heli's headband & mittens - she is not unnoticed. She loves to mix'n match colours and by combining different shades of red she creates an interesting look that is really hot in this Christmas time parties. With her hair up the lovely cape underneath the coat gets all the attention it deserves; opt for a vintage one if you want to create the most one-off look. Using bracelets on both arms balances this look. 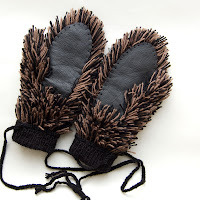 Find Major Amasova headband & mittens here. Labels: christmas parties, styling tips á la Maria N.
©2013 Heli Miikkulainen-Gilbert. Simple theme. Powered by Blogger.